Call The Aerial Guys today on 01524 490380 for a no obligation estimate and to arrange an appointment. If you live in Lancaster and are looking for local TV or satellite installation and repair experts, then call The Aerial Guys. We are passionate about providing you with the best possible service. Contact us today on 01524 490380 to book an appointment. After working on countless TV aerial installations in Lancaster over the years, we really do know our business better than anyone else. And, unlike larger companies, The Aerial Guys guarantee to deliver a reliable, local service that you can trust. Our extensive network of engineers operates throughout the North of England, which means that an engineer can help you out as soon as possible. Our extensive knowledge ensures your TV aerial installation is usually done as quickly as possible. Call us today on 01524 490380. At The Aerial Guys, our professional and approachable engineers will assess your TV aerial requirements on arrival, offering you a fixed quote before any work begins. 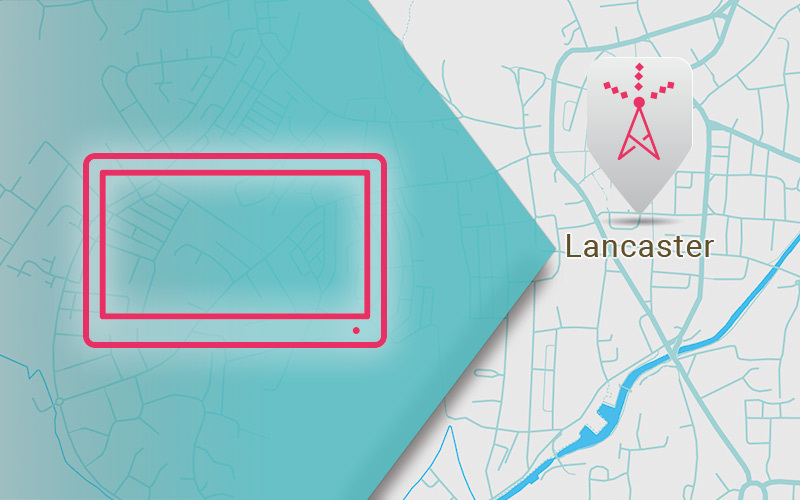 From TV aerial repairs in Lancaster to installing a new TV setup, The Aerial Guys are always on hand to make sure you receive the best picture possible. So, why not speak to one of our technical advisers today on 01524 490380 to find out how to arrange a visit from your local engineer in Lancaster. The Aerial Guys are also experts in satellite installations in Lancaster. If you’re looking for a comprehensive satellite installation, then our engineers can install the whole system – from fitting your satellite dish, to configuring your set-top box and any associated cabling. At The Aerial Guys, we have specialist knowledge in all the main satellite services, including Sky, Freesat and European satellite installations, so can fit your TV with whatever system you prefer. Speak to The Aerial Guys today on 01524 490380. If you are noticing that your satellite signal is intermittently scrambled or frustratingly pixelated, then put your worries aside, as The Aerial Guys are fully equipped to carry out full satellite repairs. Our professional engineers keep a wide range of equipment, suitable for all the main satellite platforms. That means that we can often fix the problem on arrival. Our knowledge of the Lancaster area means that we can be with you in no time, when you need us the most. Our expert engineers cover the entire Longridge area. So, for local TV installations in Lancaster, or satellite repairs and installations, make The Aerial Guys your first point of contact. So, if you have problems with your TV aerial, or need a local satellite installation and repair service in Lancaster, make sure you speak to The Aerial Guys today on 01524 490380. It pays to shop around when it comes to finding the right subscription TV package for you and your family. Each have their own advantages and disadvantages. At the end of the day, the final decision should always be based on which service will provide the most complete viewing experience for the best possible price. There are numerous comparison websites available, which will often have exclusive deals available. Bill is 65 and lives just outside Lancaster. “I decided to downsize when my wife passed away, so I moved to a smaller place. I had to set up my TV and satellite system from scratch and I didn’t know where to start. I thought I knew how to do it, but it really needed a professional. I found out about The Aerial Guys and asked them to come and help. “They were round the same day! I hadn’t expected them to be there so quickly but they sorted out my system there and then. They even sorted out all the cabling and left it looking very tidy. I can’t wait to switch it on and get back to my viewing. The service really was exceptional – I couldn’t fault The Aerial Guys at all. They were patient and very supportive. Plus, it didn’t cost me that much either. Job done!” Bill says.